Here are the latest ratings for The Office TV series. Michael Scott (Steve Carell) is gone so Andy Bernard (Ed Helms) has taken on his role as the new regional manager of Dunder Mifflin. The eighth season of The Office typically airs Thursday nights at 9pm on the NBC network. These are the TV show’s ratings for the 2011-12 season, the best way to tell if The Office will be cancelled or renewed for a ninth season. Check out our NBC ratings report card to see how this show’s numbers compare with the others on the network. 2.3 in the demo (0% episode-to-episode change) with 4.49 million; third in the timeslot. Season average: 2.77 in the demo with 5.39 million. Demo average rank: #1 of 20 scripted TV shows on the network (Fall 2011 – Spring 2012). 2.3 in the demo (+10% episode-to-episode change) with 4.44 million; third in the timeslot. Season average: 2.79 in the demo with 5.42 million. 2.1 in the demo (-5% episode-to-episode change) with 4.17 million; third in the timeslot. Season average: 2.81 in the demo with 5.47 million. 2.2 in the demo (0% episode-to-episode change) with 4.35 million; second in the timeslot. Season average: 2.84 in the demo with 5.53 million. 2.2 in the demo (-8% episode-to-episode change) with 4.39 million; fourth in the timeslot. Season average: 2.88 in the demo with 5.59 million. 2.4 in the demo (-8% episode-to-episode change) with 4.87 million; third in the timeslot. Season average: 2.91 in the demo with 5.65 million. Demo average rank: #1 of 18 scripted TV shows on the network (Fall 2011 – Spring 2012). 2.6 in the demo (+4% episode-to-episode change) with 4.89 million; second in the timeslot. Season average: 2.94 in the demo with 5.70 million. 2.5 in the demo (-4% episode-to-episode change) with 4.95 million; second in the timeslot. Season average: 2.96 in the demo with 5.74 million. 2.6 in the demo (+13% episode-to-episode change) with 5.02 million; third in the timeslot. Season average: 2.99 in the demo with 5.79 million. Demo average rank: #1 of 17 scripted TV shows on the network (Fall 2011 – Spring 2012). 2.3 in the demo (-8% episode-to-episode change) with 4.38 million; third in the timeslot. Season average: 3.01 in the demo with 5.85 million. Demo average rank: #2 of 17 scripted TV shows on the network (Fall 2011 – Spring 2012). 2.5 in the demo (-11% episode-to-episode change) with 5.19 million; third in the timeslot. Season average: 3.06 in the demo with 5.95 million. 2.8 in the demo (-7% episode-to-episode change) with 5.31 million; third in the timeslot. Season average: 3.11 in the demo with 6.01 million. Demo average rank: #1 of 16 scripted TV shows on the network (Fall 2011 – Spring 2012). 3.0 in the demo (+3% episode-to-episode change) with 6.07 million; third in the timeslot. Season average: 3.13 in the demo with 6.07 million. 2.9 in the demo (0% episode-to-episode change) with 5.90 million; third in the timeslot. Season average: 3.15 in the demo with 6.07 million. Demo average rank: #1 of 15 scripted TV shows on the network (Fall 2011 – Spring 2012). 2.9 in the demo (0% episode-to-episode change) with 5.79 million; first in the timeslot. Season average: 3.17 in the demo with 6.09 million. Demo average rank: #1 of 13 scripted TV shows on the network (Fall 2011 – Spring 2012). 2.9 in the demo (0% episode-to-episode change) with 5.71 million; first in the timeslot. Season average: 3.20 in the demo with 6.12 million. 2.9 in the demo (-3% episode-to-episode change) with 5.55 million; first in the timeslot. Season average: 3.24 in the demo with 6.17 million. 3.0 in the demo (-6% episode-to-episode change) with 5.96 million; second in the timeslot. Season average: 3.29 in the demo with 6.27 million. 3.2 in the demo (+10% episode-to-episode change) with 6.15 million; third in the timeslot. Season average: 3.33 in the demo with 6.32 million. 2.9 in the demo (-12% episode-to-episode change) with 5.53 million; third in the timeslot. Season average: 3.36 in the demo with 6.35 million. Demo average rank: #1 of 11 scripted TV shows on the network (Fall 2011 – Spring 2012). 3.3 in the demo (+3% episode-to-episode change) with 6.08 million; third in the timeslot. Season average: 3.5 in the demo with 6.56 million. Demo average rank: #1 of 11 scripted TV shows currently on the network. 3.2 in the demo (-9% episode-to-episode change) with 5.82 million; second in the timeslot. Season average: 3.5 in the demo with 6.72 million. Week two brought another loss with a 10% decline in the demo; a 3.5 rating and 6.7 million. It continues to be NBC’s best-performing show by nearly an entire demo point. Season average: 3.7 demo with 7.17 million. If there was a lot of anticipation about who would replace Michael, you couldn’t tell by the season premiere. It debuted to a 3.9 rating in the 18-49 demographic with 7.64 million viewers. That’s a solid number –especially for NBC these days — but that’s a year-to-year decline of 13%. There’s nothing to worry about though since The Office is still the network’s highest-rated series. Reference point: The 2010-11 season averaged a 3.7 rating in the 18-49 demographic and 7.31 million viewers. What do you think? Do you like The Office TV series? Do you think it should be cancelled or be renewed for a ninth season? The show should have ended on a high, Steve Carroll made it. Hasn’t been good since he left. Should not be renewed, too bad. Nebraska i didn’t like at first bit he grew on me i think the other lady that was the head of sabre before was better though.. I think we need a cameo by Steve Carrel. 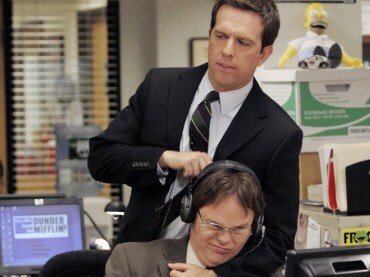 Also there needs to be more interaction/pranks between Jim and Dwight. I really don’t like Andy as the boss. Jim and Pam have lost my interest, they have stopped being the perfect, love at first sight couple they were and now a boring normal couple (not saying normal couples are boring). OK James has been on there long enough now, get him the f**k off, he is sucking out the funny of the show!! The number 1 show for the network but only third in the time slot. Some executive at NBC will be looking for work soon.